If knitting were music, the stitches would be the keys and the repeats would be the time signature. If knitting were music, a simple two-by-two rib could be translated into the Key of C (No sharps or flats, just natural notes), in 2/2 time, (or cut time). Changing just a few stitches (the notes) to cables or lace (sharps or flats) the entire musical world is at your knitting fingertips. Waiting at the symphony, or the ballet, before the performance starts, each musician tunes their instrument. They do not listen to each other and from the audience it sounds like a mixed up medley of sounds until the conductor approaches and after the introduction and a moment of silence, those fine tuned instruments come together to create beautiful music. Fine Tuned Socks are the warm up in the orchestra pit. 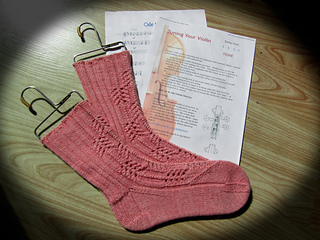 Twisted stitches and eyelet lace motifs, on the front, and a basic ribbed back of these cuff down socks, give you the best of the “ribbed socks fit so well” and “patterns socks seem to knit up so quickly” worlds and bring all the discordant tones of the orchestra warm-up together into a classic melody.